This Sunday was the feast of the Baptism of Christ. As it happens, both Mother Anne-Marie and I were preaching. I was playing at home at St John’s while Mother Anne-Marie was playing away at the church of St Paul in Woldingham, another church in our team. So, this week you get two sermons for the price of one. At St John’s, immediately after the sermon we go down to the font and give thanks for the gift of baptism, following which everyone is sprinkled with water from the font, hence the end of the sermon. Last Sunday the gospel reading was the feeding of the five thousand, followed by Jesus walking on the water. The feeding of the five thousand is one of the few miracles to appear in all four gospels. We had the version from John. To expect the unexpected shows a thoroughly modern intellect, said Oscar Wilde. Which might explain why the disciples, living as they did two thousand years ago, spectacularly failed to expect the unexpected even though the unexpected is what kept happening. Which clears that up! As far as that person is concerned you can’t expect the unexpected. They’d have got on well with the disciples. Because you might have thought that the disciples, having seen what Jesus has been doing, would have learned to expect not just the unexpected, but the downright impossible! Already by this point in Jesus’ ministry, according to the writer of John’s Gospel, they have seen him turn water into wine, they have seen him heal an official’s dying son from a distance, they have seen him heal an invalid at the pool of Bethesda. By now they should have been ready to expect just about anything. And yet it seems that although they had seen what Jesus could do they still couldn’t get their minds around the reality that the impossible was possible when Jesus was involved! That the unexpected kept happening. Constantly they found their faith in Jesus being out to the test – deliberately put to the test – by Jesus. And in our gospel reading this morning we see two impossible situations where the disciples – and in a very real sense, we too – have their faith put to the test. We see Jesus’ disciples face two impossible situations; will they respond in faith? Will they trust that Jesus has everything under control, even though it may not seem so? Jesus is followed by a massive crowd to a remote place, and we are told that Jesus tests Philip by asking him where they can buy bread for all these people. He knows what he is going to do, but he wants to find out how Philip will respond to the situation. Note that there is no indication that these people are actually hungry – but Jesus has decided to feed them anyway. Philip responds to the test in a very human way: he considers the finances and concludes that it is totally impossible as they would need a huge amount of money to feed everyone, more than half a year’s salary. Quite where he thought they could by food from is a mystery – they were in a remote place! 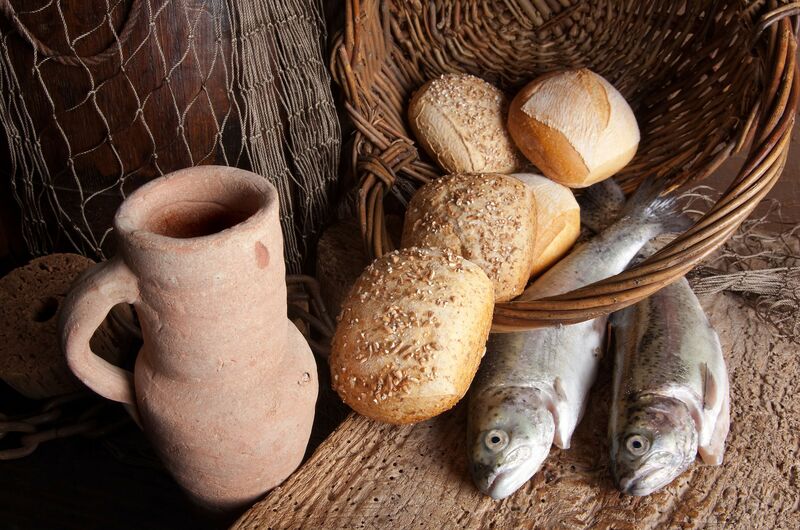 Then Andrew chips in, mentioning that he has found a boy with five barley loaves (the cheapest, least palatable bread) and two fishes (probably pickled fish of some kind,) but states this small amount of food would be little help in feeding the crowd. Afterwards, Jesus goes off by himself to get away from the crowd. Being well acquainted with the temperamental nature of the Sea of Galilee, the disciples realise that they can wait no longer if they are to cross before a brewing storm breaks. And they set off across the sea leaving Jesus behind! Why? We don’t know. What were they thinking? Anyway, three or four miles in, after hours of hard rowing, exhausted, with conditions deteriorating and still only halfway across the lake, they are clearly in trouble. Again, they are in a truly hopeless situation: all alone and believing Jesus to be too far away to help. Indeed, when Jesus does approach them upon the water they fail to recognise him and are petrified. They may have recently witnessed him miraculously feed more than five thousand people, but they still seem to struggle to believe that he could be there to help in their desperate situation. Once Jesus has reassured them it is him, however, and he is on board, another miracle occurs: the boat immediately finds itself ashore! Well, what are we to make of these two miracles – feeding thousands with five loaves and two fish, walking on water in the middle of a storm and then bringing the boat and its occupants immediately to their destination? Well, both these miracles are really about the same thing. Have the disciples learned to expect the unexpected where Jesis is concerned? Have they come to realise who Jesus is and what he can do? Have they come to believe that Jesus is the Son of God and that he can do anything? And – more to the point – the writer of the gospel is really asking the same questions of those for whom he wrote, and of us here today. For the point of the feeding of the five thousand is not that five thousand people are fed. It is that Jesus is testing his disciples to see whether they have now realised that the unexpected, the impossible, can happen. “What are we going to do to feed these people?” he asks. Jesus tests the disciples. Have they learned that with Jesus they can expect not just the unexpected, but they can expect what those without faith would think impossible? In today’s gospel reading they are not yet there and they didn’t get there until after the resurrection. The writer of the gospel, though, is putting the same test to those for whom he is writing his gospel. Those who will read his words – or more likely hear them read – and who live in the light of the resurrection. Do you have the faith to believe that Jesus can work miracles, that Jesus can use his power to overcome the natural order of things, that Jesus can do the unexpected in your life? We face the same test. In our gospel reading Jesus dealt with a crowd needing food and a boat of disciples at sea in a storm by – in both cases – doing that which seemed impossible. Do we, as his followers today, pass the test? Do we believe that Jesus can deal with the seemingly impossible problems that beset us – in our world, in our nation, in our own daily lives? Jesus didn’t respond in ways that the disciples expected – and that can often present a problem for us. Of course, it is far from easy to keep exercising faith in situations such as when we lose our job, or are diagnosed with a terminal illness, or our marriage breaks up, or a loved one dies, and so on. For Jesus doesn’t always respond in the way that we might, at one level, want. He doesn’t wave a magic wand and make everything go back to how it was. He often responds in unexpected ways. As with the disciples, he is there, ready to support in the ways that he thinks best, and help us find a way through. And faith is about understanding that Jesus, even when things seem impossible, can do the unexpected and help us through, and it’s about trusting him to do it. Faith – as I said a couple of weeks ago – Forsaking All I Trust Him. It was in difficult and seemingly unsolvable situations times that Jesus took the opportunity to try and inspire faith from his disciples, because those times should have forced them to look outside themselves and seek God’s help through Jesus. It was clearly important to Jesus that his disciples had a growing faith and if the disciples needed to develop their faith, so must we. So may we encourage our faith to grow, putting it into practice each day by choosing to believe that Jesus can and will help us, no matter how difficult our situations. Br trusting in him, trusting that Jesus can use his power among us: for what is impossible for us, is possible for Jesus! I’m going to finish with the words of Saint Paul which end our extract from his letter to the Ephesians, a prayer that reminds us that God can do so much more than we often think he can! It’s a prayer that we used it regularly during worship at the Church Army College when I was there, and it has become one of those prayers that I know by heart and use at opportune moments. This is the version from the Common Worship prayer book. Here’s my sermon for this week. I used the gospel reading, the story of the sinful woman who anointed the feet of Jesus at the house of Simon the Pharisee. Essentially the story of two people who for their own very different reasons sought out Jesus.